With two new BlackBerry smartphones making their appearance not too long ago, one of them has jumped out in front and is already being showcased to eager customers. 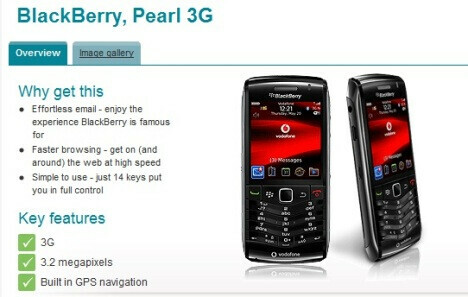 The countdown has just begun for Vodafone UK customers who are in favor of trading up to RIM's BlackBerry Pearl 3G when it finally makes its way to their shelves. The device has been recently spotted over on Vodafone UK's web site where anxious customers can sign up to receive updates about the handset. Unfortunately though, an exact date for its release and pricing are still unknown despite the handset being shown off on the web site. However, we're sure that customers will still be delighted to see the handset making its way donning the new look.